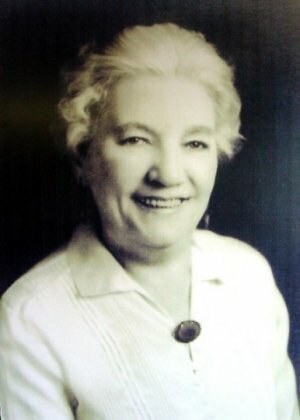 Laura Ingalls Wilder is a well-known American author. Her "Little House" books are based on her childhood remembrances. She was born in 1867. Her father was Charles Ingalls and her mother was Caroline Quiner Ingalls. They were both from pioneer families who lived in the mid 1800's. Her mother became a teacher at age 16 earning about $3 a week which she used to help support the family of nine. After her parents' marriage they moved to a log cabin in Wisconsin. Mary was their first child, and two years later Laura was born in the Big Woods. When Laura was three they moved west to Kansas. Pa built a house of logs with a dirt floor. Baby Carrie joined the family. The next year they decided to return to Wisconsin. When Laura was 7 they packed the covered wagon and moved to Minnesota. 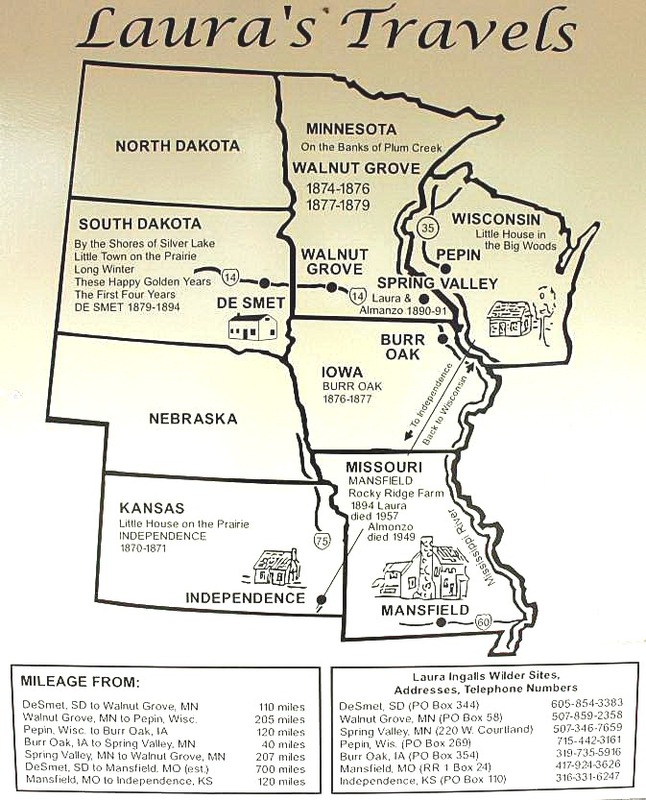 The town was Walnut Grove and their 172 acre farm was by Plum Creek. 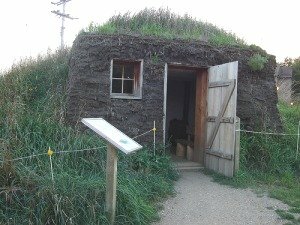 Until Pa could build a house, they lived in a dugout, a cavelike area carved out of the earth. They were glad to move into their new house which had real doors and glass windows. Mary and Laura shared a room in the attic. Disaster struck one summer day when swarms of grasshoppers came and devoured the wheat crop and all the vegetation. Many people left the town and returned East. That summer Pa walked 200 miles east to find a job. At the end of the summer he returned home. A son, Charles Frederick was born. That spring millions of grasshoppers hatched from the eggs which had been laid and for a second year the crops were ruined. They packed the wagon and back-tracked to the east to stay with family; 13 people in one farmhouse. That summer baby Freddie died. He was a sickly child and only lived nine months. Their next move was to Burr Oak, Iowa where they would live in and work for a hotel. Then they lived for a while above a grocery store in Burr Oak. Finally they were able to move to a brick house outside of town. That spring Ma had another baby they named Grace. One day a rich neighbor, Mrs. Starr came to see them. She wanted to adopt Laura. What a relief it was to the child when Ma politely said, "No". Pa got the urge to move again, so back they went to Walnut Grove. When Laura was 12 Mary became very ill with meningitis. * She had a stroke which caused her to become blind. The family was devastated and Laura had to accept more responsibility. She became Mary's "eyes" and would describe things around them. Pa was able to get a job as a store manager for the railroad in Dakota Territory. The family followed him later by train and they lived in the railroad camp. Few men had brought their families with them. When winter came, the workers went back east to their families, but the Ingalls family was able to live in the surveyor's roomy house on the banks of Silver Lake. Pa had been hired to protect the property. As immigrants* came through the area, they would find a place to sleep at the Ingalls' and Ma cooked for them. Pa looked for land to homestead* near De Smet. In the spring the family moved into town and Laura, age thirteen, began to teach Carrie and her friends in their home. She was De Smet's first schoolteacher. It was bitterly cold when winter came to South Dakota as the temperature dropped to 40 degrees below zero. Sometimes Laura had to thaw the frozen ink before she could do her lessons. The moved out to the homestead and Laura had a sewing job in town. In six weeks she had earned $9. She would help to send Mary to a school for the blind in Iowa. The next winter Laura went to live at a small settlement and taught five students. She earned $40 in the two months she was there. For eight weeks Almanzo, who was ten years older than Laura, came every Friday afternoon with his horse-drawn sleigh and took her home. On Sunday he returned her to her job. They didn't talk much during the trips, but their love for each other began to grow. Almanzo, nicknamed "Manly" by Laura, courted her for three years and they were married when Laura was 18 years old. They farmed and their first wheat crop was hailed out. They had to move into a shanty and there baby Rose was born. Laura's parents quit farming and moved into De Smet where Pa became the town carpenter. Laura and Manly became very ill with diphtheria* and Rose had to stay with Ma and Pa until they recovered. Manly went back to work in the field too soon and suffered a mild stroke. His legs were partially paralyzed and his health was never the same again. They had a second child, a son, who only lived a few weeks. He was a sickly child and they feared they would lose him. They never gave him a name. One day when she was three years old Rose accidently started a fire and the house burned to the ground. Because they had suffered so many losses, they felt they had to leave. 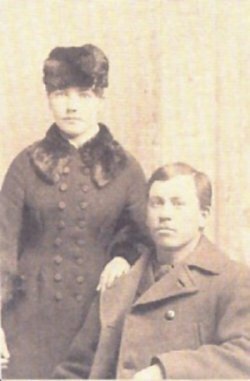 They went to Minnesota where Almanzo's parents lived. They stayed a year and a half and then spent a short time in Florida. After they returned to De Smet Manly did odd jobs and Laura worked as a dressmaker. It was a difficult time. Friends told them about the beauty of the Ozark Mountains. They packed all their belongings in the wagon and headed toward Missouri. After 45 days they had traveled 650 miles and arrived in Mansfield. Three weeks later Manly had found some land and put a down payment on 40 acres. Laura named it Rocky Ridge Farm. There was a small log cabin and the previous owner had left 400 little apple trees ready to be planted. Manly cut down trees to clear the land and sold some of the wood. They started a garden, raised chickens, and sold eggs. Rose rode her donkey Spookendyke into Mansfield to go to school. To increase their income, the family moved to town where Manly delivered goods and Laura cooked meals for the railroad men. In 1902 Laura received word that Pa was dying. It had been nearly eight years since she had seen her family. She rode trains to return to De Smet to see them and to be with her father before he died. Laura became a successful poultry* farmer and began to share her ideas in weekly articles in a farm magazine, the "Missouri Ruralist". * Later she wrote articles for other newspapers. Rose went to live for a year with her aunt Eliza Jane, Almanzo's sister, to finish school. She graduated at the top of her class. She moved to Kansas City to work. There she met and married Gillette Lane, a newspaper reporter. Rose became a newspaper woman in San Francisco. She asked her mother to come for a visit. They had not seen each other for four years. Laura rode a train west to see her daughter. She remained in San Francisco for two months. Later Rose and Gillette divorced. Rose traveled extensively and became a famous writer. After years of work, the Wilder's home was finished. It was a two-story house with ten rooms and four porches. Laura was content in it. She began writing about her pioneer days in magazine articles. In 1924 Ma died at the age of 84, but Laura did not go back to De Smet for the funeral. Mary, her blind sister who had lived with her parents all her life, went to live with her sister Carrie and her husband. Following Ma's death and then Mary's death, Laura began to think more and more about writing down her childhood memories. She was 63 years old when she began to write about her life as a pioneer. She wrote for months and titled the manuscript Pioneer Girl. She took the tablet to Rose and asked her to type it. They shortened the story and renamed it When Gramma Was a Little Girl. Her story was rejected by a publisher. After a revision it was accepted with the new title Little House in the Big Woods. Children loved it and wanted more stories. It was awarded a Newbery Honor. (Look at the years 1938, 1940, 1941, 1942, and 1944 to see all the honors her books received.) The Newbery Medal is awarded every year by the American Library Association for the most distinguished* American children's book published the previous year. The next year she published Farmer Boy, the story of a year in Manly's life. Next came Little House on the Prairie. 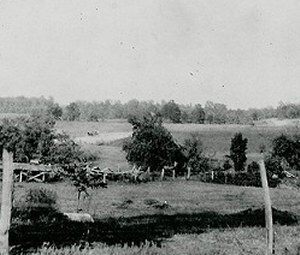 On the Banks of Plum Creek was about the hard times in Minnesota. Laura was now a famous author. Rose moved to Connecticut and the Wilders moved back into the farmhouse which now had electricity. After visiting Old Settlers Day in De Smet and seeing old friends again, Laura wrote By the Shores of Silver Lake. Her next books were The Long Winter, Little Town on the Prairie, and These Happy Golden Years. Laura was 76 years old when she wrote her last book. Her books were translated into many languages and even into Braille. The Wilders had a very large mailbox. Some days she would receive 50 letters from children who had read her books. She answered every letter personally. In Detroit a library was named in her honor, and in California a library named its children's room the "Laura Ingalls Wilder Room". In 1949 Manly had a heart attack and a few weeks later he died at the age of 92. He and Laura had been married 64 years. The "Man of the Place" was gone and Laura was lonely. After his death she wrote another book First Three Years and a Year of Grace about the early years of their marriage, but she did not publish it because it was so sad. It would be published 14 years after her death titled The First Four Years. On her 84th birthday Laura Ingalls Wilder received nearly a thousand cards, letters, and telegrams. She was determined to live past the age of 90 just as Manly had done. She did. She died three days after her 90th birthday. The "Little House on the Prairie" TV series was produced from 1974 to 1983. It was based on the Little House books by Laura Ingalls Wilder. The family members portrayed* were real people; Laura, her parents, and her sisters, but the episodes contain some fictional characters and events which never happened. The popular series was syndicated* and the Hallmark Channel airs the episodes daily. Melissa Gilbert portrayed Laura Ingalls Wilder. Television: to sell (a program, series, etc.) directly to independent stations. Press "Go" to search for books about Laura Ingalls Wilder. Rose Wilder Lane has a fan in me. Laura Ingalls Wilder also has a fan in me. My four-week-old raccoon cut-out likes "Little House on the Prairie". I have a crush on Laura Ingalls Wilder. I am a twenty-nine-year-old woman. My raccoon cut-out is learning Spanish. I saw a photo of Laura Ingalls Wilder with her two sisters. 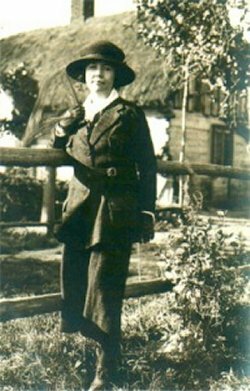 I also have a crush on Rose Wilder Lane. "Little House on the Prairie" is one of my favorite TV shows. Wow. I had to do an impersanation of laura Ingalls wilder during a tea party and this website had so much information. There was so much in it than whats in the books and other websites. Thank you and keep up making so many helpful websites. We recently did a little more research on Laura and her family for a section of our website. We mentioned her in our Building A Home in Independence. Such a great story and I really enjoyed your added info about The Little House on the Prairie. Thanks for sharing. thank you for all the info you put out on the page! it really helped me a lot with my fifth grade woman's report we are required to do. it made the project fun and easy!thanks again! What a treasure of information. Thank you so much for putting all of this out here on the web and making it shareable. You are truly a blessing. Thank you. I have added that note to the Laura Ingalls biograpny. This page displayed 203,634 times.